Short on Time? Get a Dental Crown in One Visit With CEREC®! “Looks like you’re going to need a crown.” What is going through your mind when you dentist says this to you? Maybe how you finally found time to visit your dentist for your regular checkup and cleaning, and now you imagine all the follow-up visits you need to save your tooth. Before you panic, your Seattle dentist has good news for you. Using the latest dental technology, Dr. Kollia and Dr. Fu offer the convenience of CEREC®. 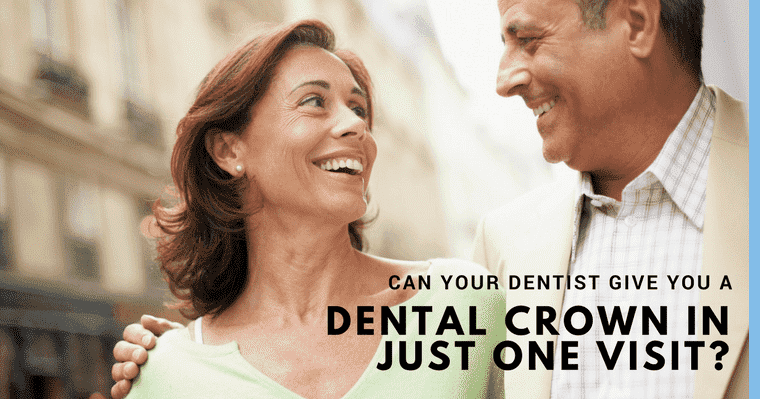 Now you can get a dental crown in just one visit! Strengthening a tooth with a large filling or multiple fillings. Improving the appearance of misshapen teeth. Restoring the structural strength of a cracked, broken, or worn tooth. Fortifying a tooth from fracturing after a root canal. Typically a crown requires multiple dental appointments. First, making an impression. Using traditional methods means keeping a messy, gooey material in your mouth for several minutes. If you have a strong gag relax, it may not be the most pleasant experience! Your dentist next sends your impression out to a dental lab to produce your crown. Then your next appointment (several weeks later), when your dentist replaces your temporary crown with the fabricated one and makes any adjustments necessary for size, shape, and color. When both the patient and dentist are satisfied with the fit, your crown is cemented in place. How Can CEREC® Give You a Dental Crown in One Visit? CEREC® solves many of the inconveniences of dental crowns. Using CAD/CAM technology to take precise digital impressions make goopy impressions and multiple fitting appointments things of the past. The CEREC® machine is located right in our Seattle dental office where your dental crown is milled from a single piece of porcelain while you wait! Ready for Your Dental Crown in One Visit? Use your time wisely and schedule your appointment with Aesthetic Contemporary Dentistry today!